This thesis presents new methods for modeling and efficient rendering of botanical scenes and objects. The first method allows for producing 3D tree models from a set of images with limited user intervention by combining principles of image- and simulation-based modeling techniques. This technique meets two important criteria improving common modeling techniques: it is possible to achieve a high visual similarity to photographs and at the same time allows for simple manipulation of the resulting plant by altering the input photographs and changing the shape or density, providing the artist with an expressive tool while leveraging the need for manual modeling plant details. The second method improves the concept of sketch-based modeling tools for plants. The proposed system converts a freehand sketch of a tree drawn by the user into a full 3D model that is both, complex and realistic-looking. This is achieved by probabilistic optimization based on parameters obtained from a database of tree models. Branch interaction is modeled by a Markov random field, to inferring missing information of the tree structure and combining sketch-based and data-driven methodologies. 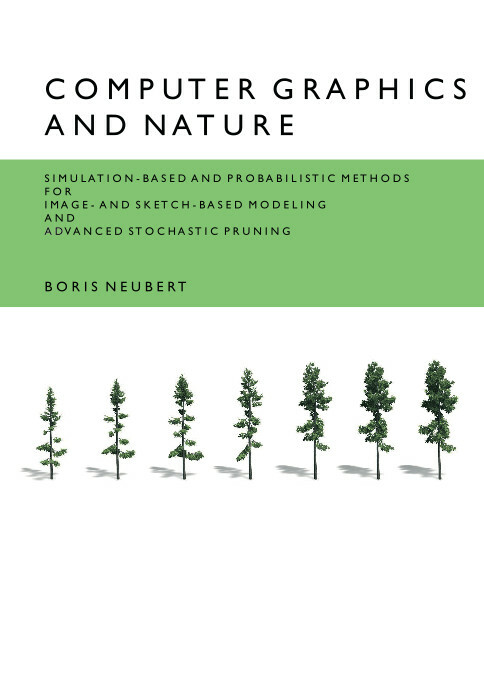 Both modeling methods presented in this book, produce very complex tree models. While this richness is needed to model highly realistic scenes, it leads to a complexity that makes real-time rendering impossible. We present an optimized pruning algorithm that allows for considerable geometry reduction in large botanical scenes, while maintaining high and coherent rendering quality. We improve upon previous techniques by applying model-specific geometry reduction functions and optimized scaling functions. To optimize the improvement, we propose the use of Precision and Recall (PR) as a measure of quality to rendering and show how PR-scores can be used to predict better scaling values. Finally, we extend the originally purely stochastic geometry prioritization for pruning in order to account for a view-optimized geometry selection, which allows taking global scene information, such as occlusion, into consideration. We demonstrate our method for rendering of scenes with thousands of complex tree models in real-time.